Thursday’s blog will be posted by 1 PM. My goal is to publish new posts twice a week — Mondays and Thursdays. However, if you don’t see a new post on Thursday, it’s because I was too busy, so please look for a new one the following Monday. This Thursday’s post will be about the auction of the superb Milhous collection of musical orchestrions, rare cars and even Icart etchings (with very surprising results). It will be a good one! We were quite busy in Florida with four shows, but luckily we had a week off after the third show. 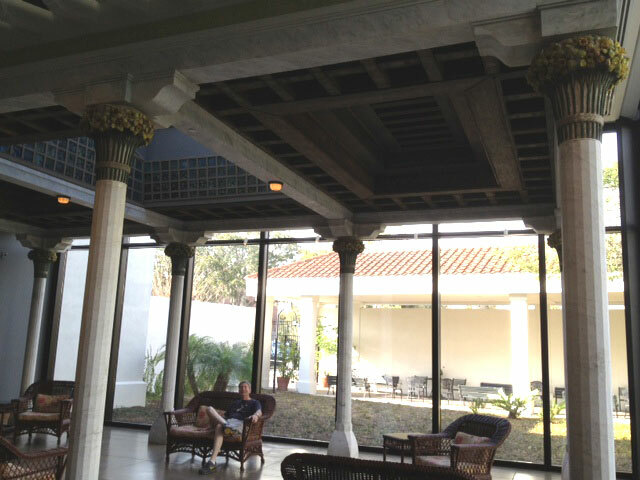 On one of those days, we visited the Morse Museum in Winter Park, Florida. It had been about ten years since we last visited, and I just couldn’t believe how much I had forgotten. For me it was the highlight of our week off. 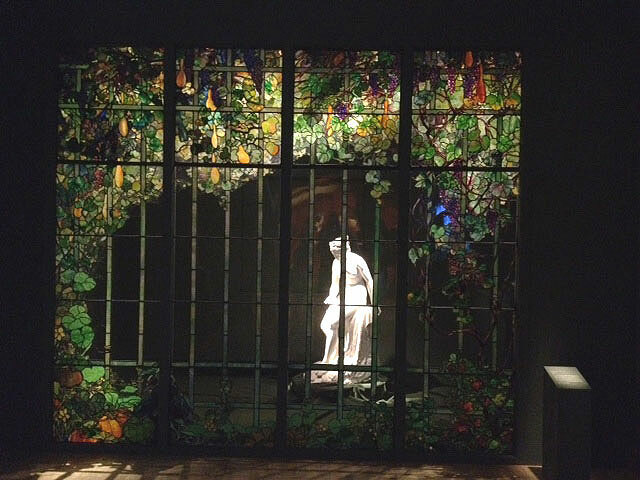 Not only were there fantastic items on display, but the museum completed construction of a new wing that houses the reconstruction of the original Daffodil Terrace from Louis Comfort Tiffany’s Long Island estate, Laurelton Hall. 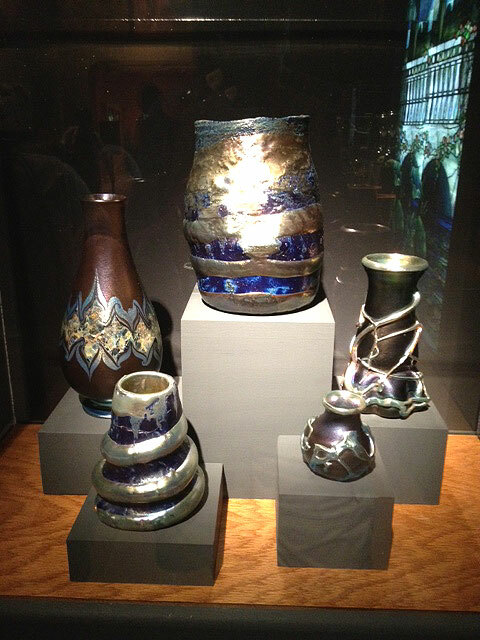 There is an astonishing selection of very rare and very beautiful Tiffany Favrile vases in the museum that ranges from padded and wheel-carved to Lava to Aquamarine to red decorated to window vases. They’re breathtaking! Then there are some truly exceptional windows and doors that will take your breath away. I can’t show you every item in the museum, but use these photos to get a taste of what’s in store for you if you make the trip. The museum is located in a very upscale section of Winter Park. Take your time and eat a block away in an outdoor cafe and enjoy the town too. Winter Park is a suburb of Orlando, so it’s just a hop and a skip from all the big amusement parks. You’ll thank me. My goal is to publish new posts twice a week — Mondays and Thursdays. However, if you don’t see a new post on Thursday, it’s because I was too busy, so please look for a new one the following Monday. 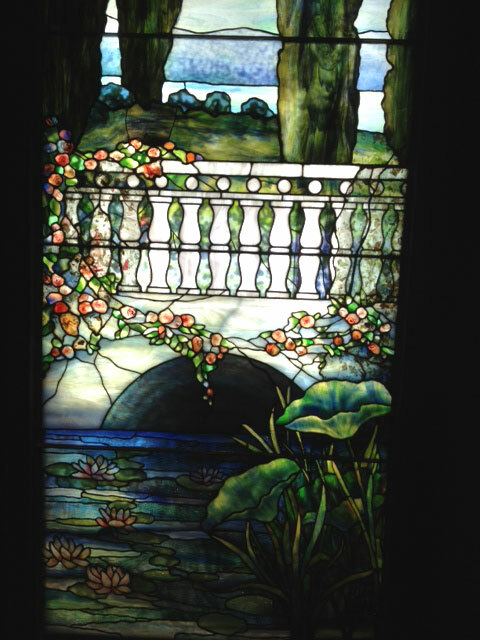 Monday’s post will be about the fabulous Tiffany collection of the Morse Museum in Winter Park, Florida. 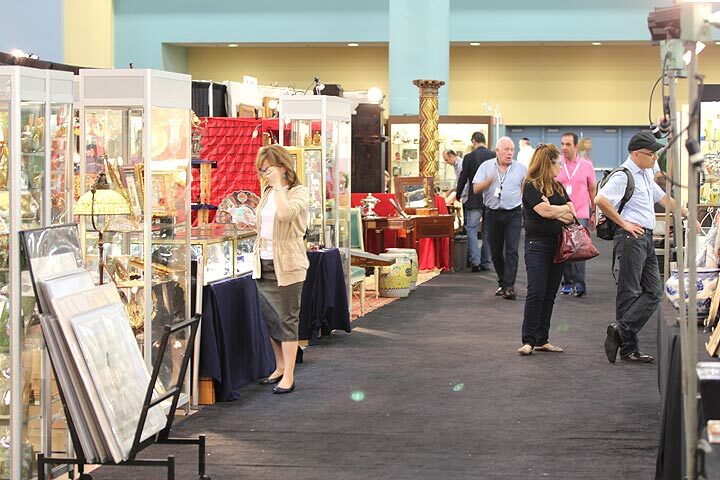 As expected, Monday’s attendance at the Palm Beach Jewelry, Art & Antique Show was lighter than the weekend’s, but there was still a decent crowd. Attendance is never the problem with this show — it’s qualified buyers. Only a small percentage of the attendees are actually interested in making purchases. 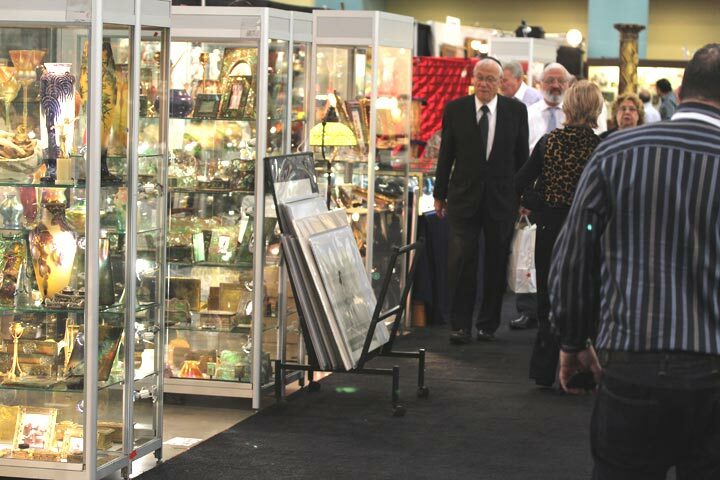 Unfortunately for me (and the other exhibitors), most are there for a good time or to appraise their own items. Tuesday was the last day of the show. Surprisingly, there were quite a few people in attendance — not as many as the weekend, but still quite good for a Tuesday. Monday was a bust with total sales of $300. (One dealer said to me that he didn’t even know that I had anything for $300. Yes, I do.) 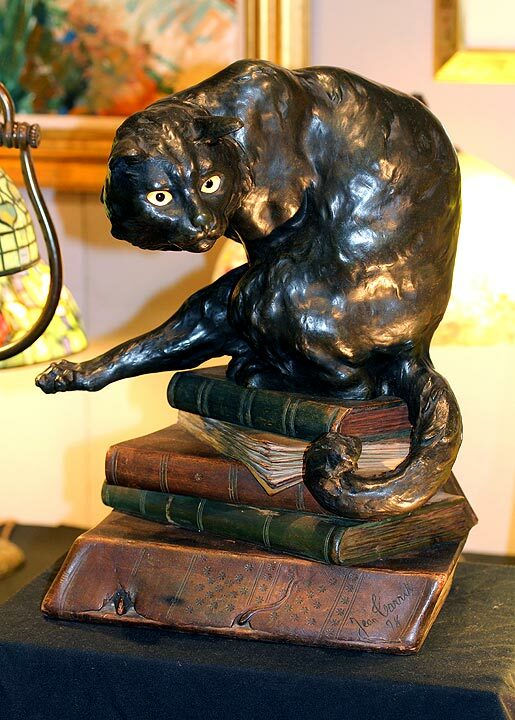 Tuesday was a better day, with a couple of nice sales, including an important bronze and carved wood cat lamp, signed and dated Jean Carrit, 1898, made in France at the dawn of electricity. My show wound up being a moderate success. I sold enough to cover my expenses and earn a fair profit. In addition, I was able to make a private purchase, as a result of the show, that will ultimately produce revenue. Business wasn’t quite as good as the show two weeks before at the Miami Beach Convention Center, but still good enough to make me want to return to Palm Beach next year. I did ask quite a few dealers about their results and found out the following. 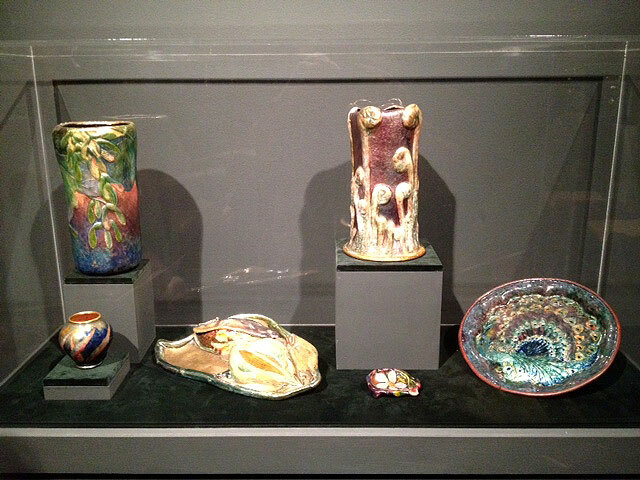 A Steuben dealer had a great show, including fabulous sales at the preview party. A majolica dealer, a ceramics dealer and a bronze and ivory dealer had fair shows, just making expenses and very modest profits — none was very happy. 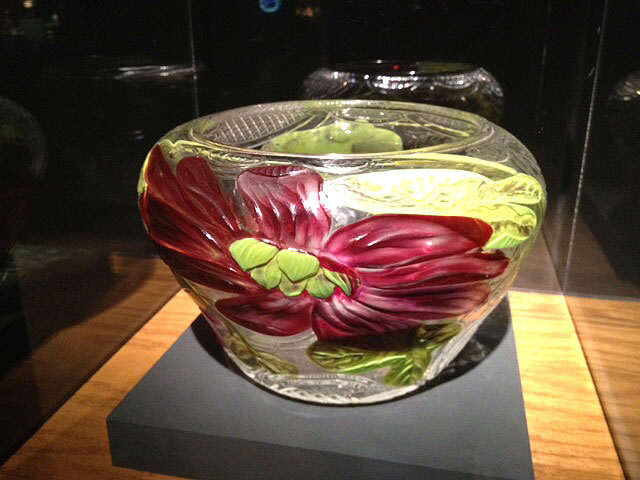 A dealer in art glass, lamps and jewelry was disappointed with his jewelry sales, but otherwise satisfied. 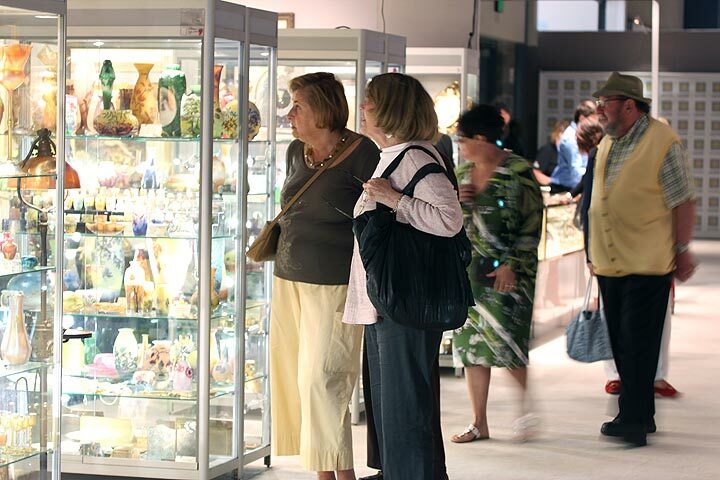 A dealer in Russian items was disappointed — he did not make his expenses and lost money on the show. Other dealers told me their results were down from a year ago. There was lots of interest, but they just couldn’t close many of the potential sales. An important dealer at the show told me that his results were good, not great. He was hopeful that he would be able to make follow-up sales after the show. One of the show promoters, Scott Diament, told me that some of the dealers had done exceptionally well, including one jewelry dealer who had sold millions (I can’t independently confirm that). He also told me that three important European dealers, who have exhibited at the world-renowned Maastricht Antiques Fair in the Netherlands, had plans to exhibit at next year’s Palm Beach show. Happy to be back in New York. Our next show is the Pier Show in New York City on the weekend of March 17th and 18th. It’s always fun, so start planning your trip to the Big Apple! My goal is to publish new posts twice a week — Mondays and Thursdays. However, if you don’t see a new post on Thursday, it’s because I was too busy, so please look for a new one the following Monday. 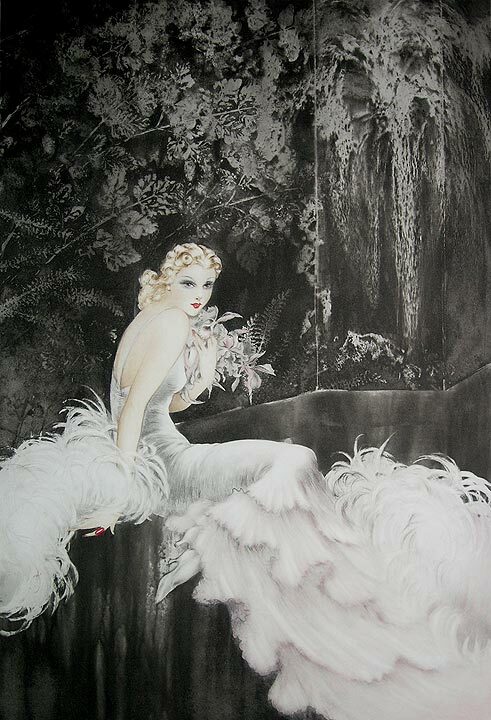 The Palm Beach Jewelry, Art and Antique Show ends tomorrow, so I won’t post the results of the show until this Thursday. 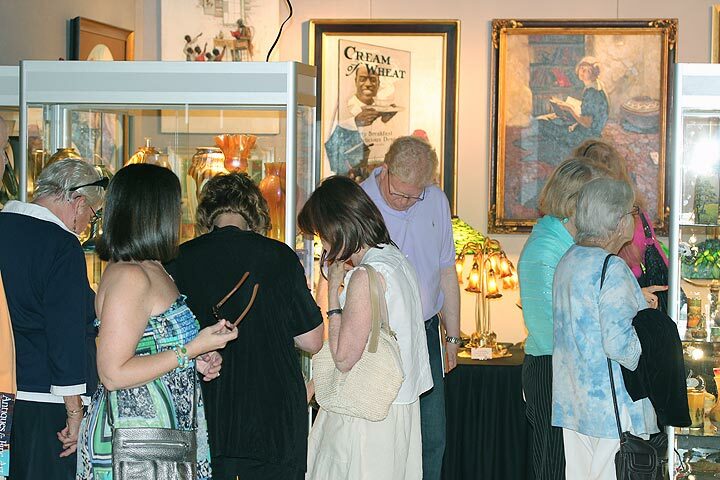 The Palm Beach Jewelry, Art & Antique Show opened on Friday night, February 18th, at 6 PM, for a preview party. There were lots and lots of people at the party and many questions. The problem was that most of the questions were from people who wanted to appraise their own items. I don’t mind answering questions if a person is up front with me. What gets my goat is a sneaky person, pretending to be a buyer, plying me for information for his/her own appraisal. Of course, the evening ended with no sales. Nothing like a preview party to put me in a bad mood. Attendance was excellent on Saturday and Sunday. Saturday was a nice day — busy, lots of questions, and sales in different categories. A good start to the show, but only a start. The Sunday crowd was the usual — fewer knowledgeable people and fewer sales, but not a bad day. So as of Sunday, the show is going okay. If sales develop on Monday and Tuesday, the show will work out fine. If nothing happens in the next couple of days, my show will be mediocre. Some of you may remember that last year I did 75% of my business on the last day. No idea what will happen this time. Tune in this Thursday for the results. I’ll ask around and see what other dealers have to say. I did see some nice action in some of the booths, so I expect that some dealers will be very pleased. Happy to be returning to New York this week and thankful the winter is almost over. Our next show is the Pier Show in New York City on the weekend of March 17th and 18th. It’s always fun, so start planning your trip to the Big Apple! My goal is to publish new posts twice a week — Mondays and Thursdays. However, if you don’t see a new post on Thursday, it’s because I was too busy, so please look for a new one the following Monday. Setup for the important Palm Beach Jewelry, Art and Antique Show starts on Thursday, February 16th, so I can’t guarantee I’ll be able to post this Thursday, but I’ll try. 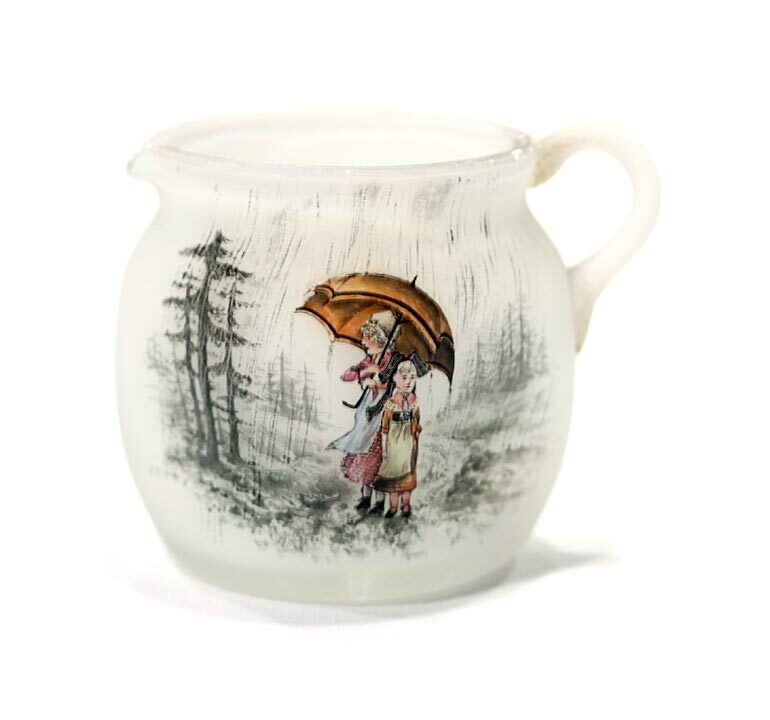 Doyle New York held their Belle Epoque sale on Wednesday, February 8th, 2012. 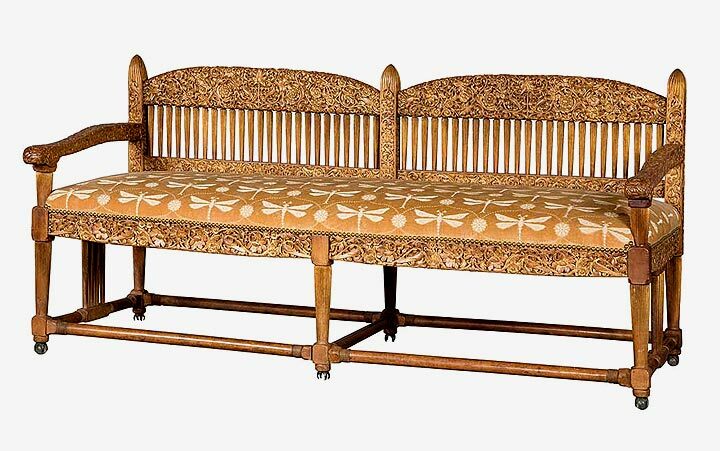 There were some fine items in the sale, including Daum vases, a Gallé lamp, Tiffany vases and a rare Tiffany Studios settee. They all did well, but the settee was on fire (well, not literally). The sale totaled $1,775,439, against a pre-sale estimate of $964,100 – $1,456,900, with 86% sold by lot and 95% sold by value. 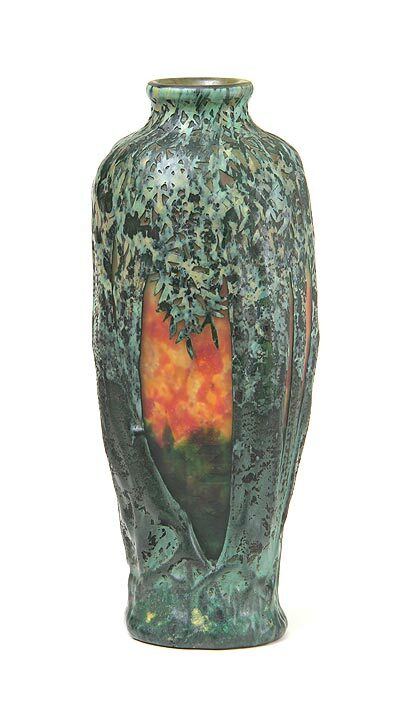 The most important Tiffany Favrile vase in the auction, lot #437, was a calla lily paperweight vase, 16½” tall, that sold for $40,625, four times its $10,000-15,000 low estimate. A fine Daum vase, lot #391, also had a great day. 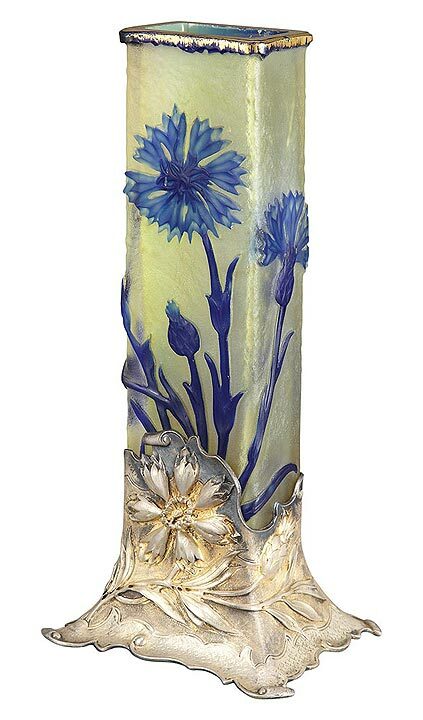 The vase was decorated with vivid blue cornflowers, wheel-carved and with an elaborate silver floral foot (probably original). Against a conservative estimate of $3,500 – $4,500, it shot to $22,500, including buyer’s premium. 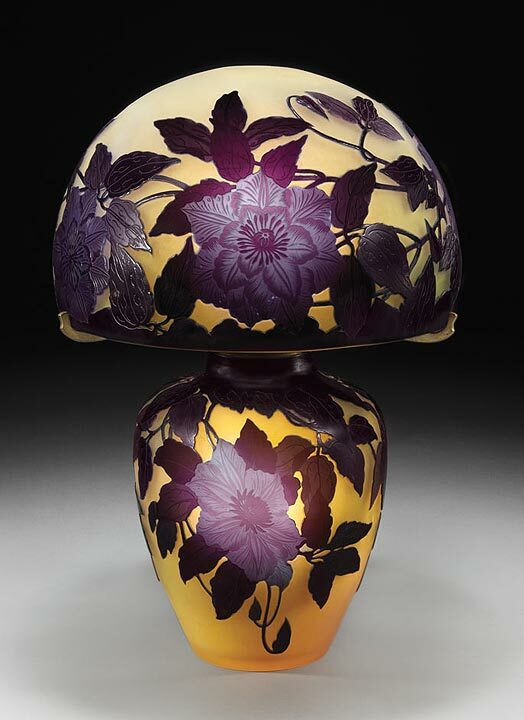 Gallé was well represented with a gorgeous purple and yellow clematis lamp, lot #413. 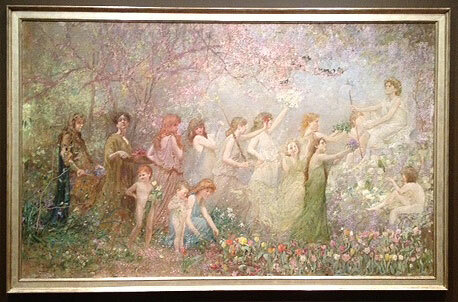 It more than doubled its pre-sale estimate of $12,000 – $18,000, to sell for $37,500. For the complete results of the sale, click on the following link. Doyle’s Belle Epoque results. There’s only one more show for us in Florida and that’s the important Palm Beach Jewelry, Art & Antique Show this coming weekend. It opens to the public this Saturday, February 18th, at 11 AM and continues until Tuesday, February 21st at 6 PM. It has some of the best dealers in the world exhibiting. My goal is to publish new posts twice a week — Mondays and Thursdays. However, if you don’t see a new post on Thursday, it’s because I was too busy, so please look for a new one the following Monday. 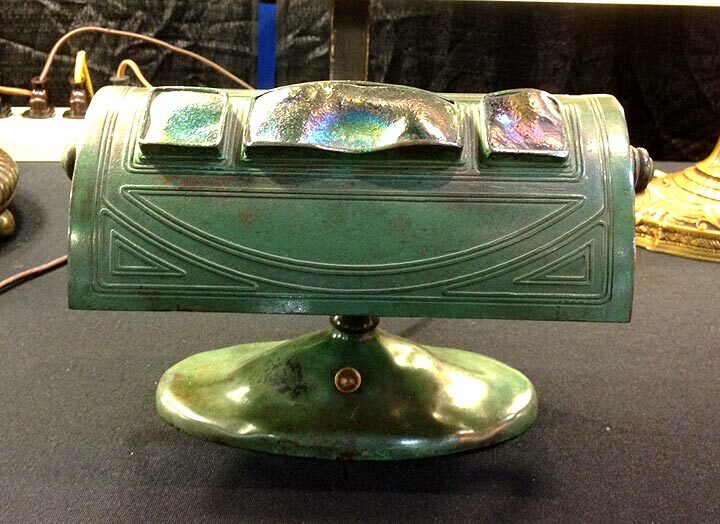 This coming Monday’s blog will be about some amazing results at Doyle’s Belle Epoque auction. 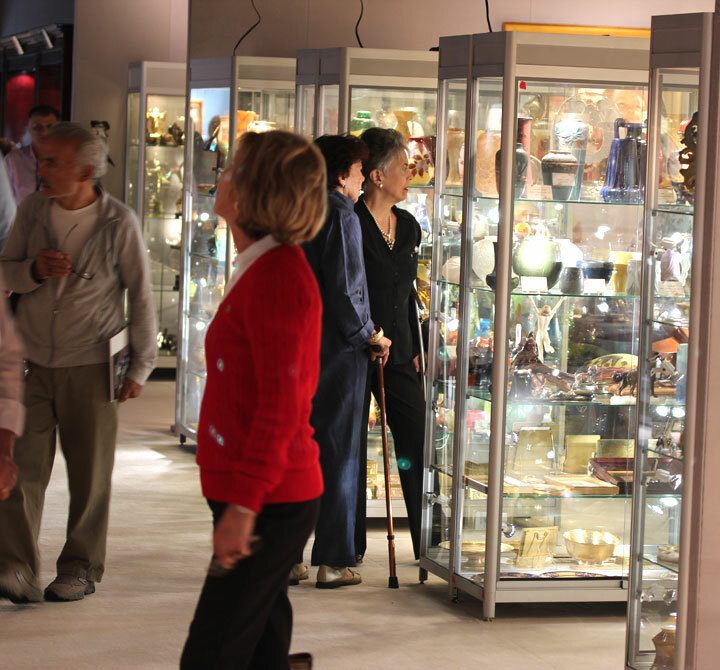 The Original Miami Beach Antiques Show opened on Thursday, February 2nd, and ended yesterday, February 6th. After speaking to many dealers, I can report the results as good to excellent. One dealer I didn’t know visited my booth unsolicited. He told me he reads my blog regularly and wanted me to know that his results were already excellent and it was only Friday. A dealer in furniture and bronze told me he finally hit his “magic” number. It was pretty easy to figure out the magic number was $1 million. Now that’s an eye-popping show. I’ve heard of other dealers selling $500,000 to $750,000, but never $1 million. Kudos for a great show! Attendance at the opening on Thursday was very good. A dealer told me he thought there 1000 people waiting at the front door at noon (perhaps an exaggeration). First day sales are usually best, because that’s when the most motivated buyers come. Personally the first day was best. Attendance, interest and sales seem to drop on a daily basis, as the least motivated buyers come into the show at the end. Overall, my show was very good — I’ve had some better and many worse. 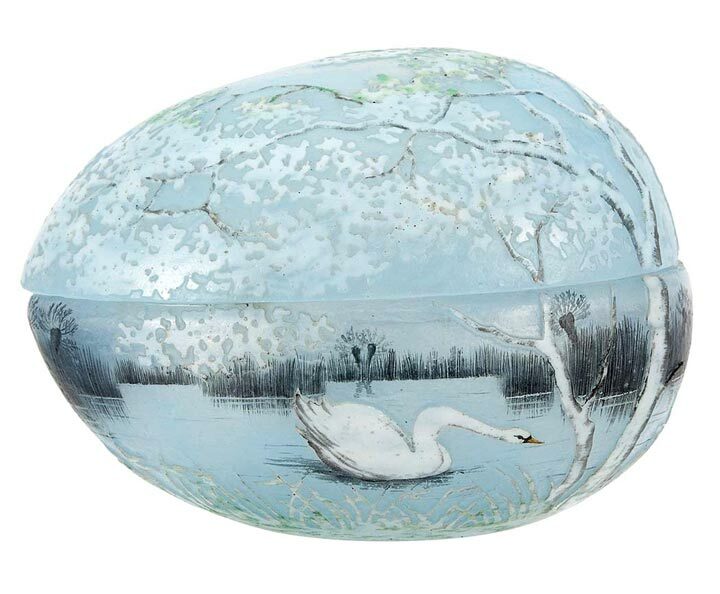 Interest was best in Pairpoint puffy lamps, French cameo glass and Icart etchings (a result I couldn’t have predicted). Back to the other dealers. Most were very satisfied with their results. A few said excellent, most said good, and very few said fair to poor. The show ended on Monday, and for the life of me, I can’t figure out why. There are almost no buyers on Monday, and the few that were there could easily have made up their minds on Sunday. To make things worse, the show ended at 6 PM on Monday, instead of 5 PM, or better yet, 4 PM. Management made announcements not to pack early, but there was no one there, so why not? 75% of the dealers were packing early. Eliminate Monday from the show and everyone will be happier. The results will be the same — same attendance, same sales. The only difference is that everyone will be spared an unnecessary day at the show. 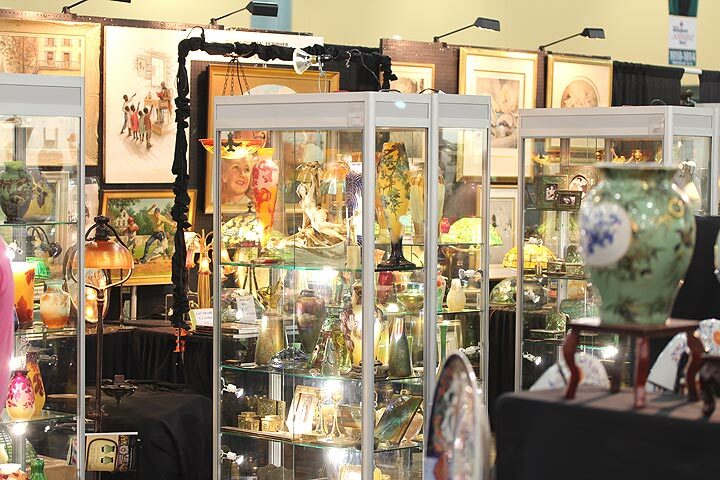 There’s only one more show for us in Florida and that’s the important Palm Beach Jewelry, Art & Antique Show. 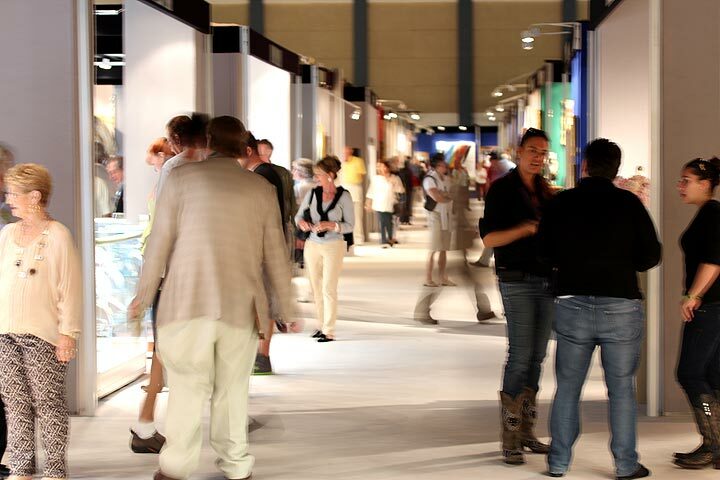 It runs from February 18 to February 21 and has some of the best dealers in the world exhibiting. We’re off this week and it couldn’t come at a better time. We’re still in business, so don’t be bashful. Call or write! My goal is to publish new posts twice a week — Mondays and Thursdays. However, if you don’t see a new post on Thursday, it’s because I was too busy, so please look for a new one the following Monday. 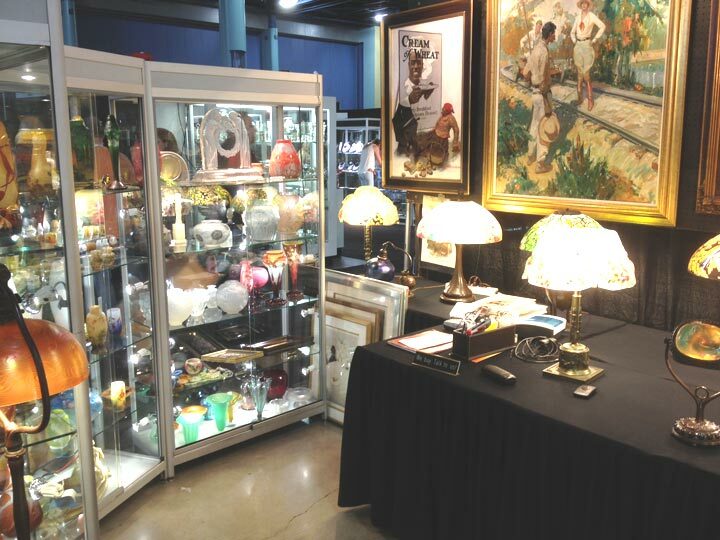 Since the Original Miami Beach Antique Show closes on Monday, Feb. 6th, I will post again on Tuesday, Feb. 7th, with the results of the show. 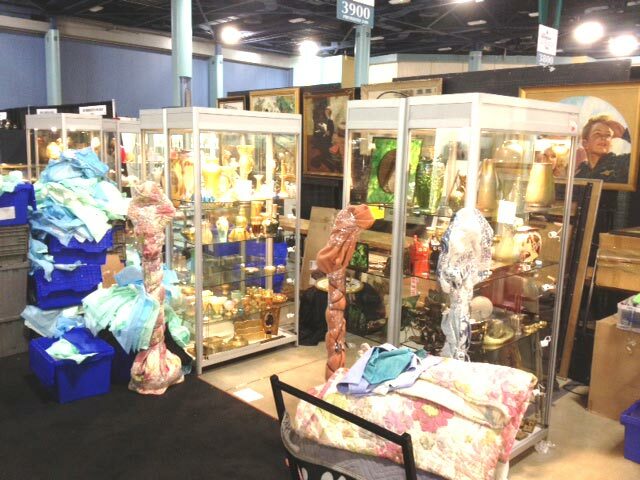 The Original Miami Beach Antiques Show started setting up on Tuesday, January 31st and continued until Tuesday, February 1st. As the show is huge, it was quite an undertaking to get all the dealers in and ready for business. Lots of business was transacted during set-up — I would estimate millions of dollars before the first paying customer will walk in the door on Thursday, February 2, 2012. I personally saw tens of thousands of dollars in business transacted. This show is one of the most exciting of the year for a variety of reasons. First, the show is huge. Second, many of the exhibitors exhibit at very few shows. 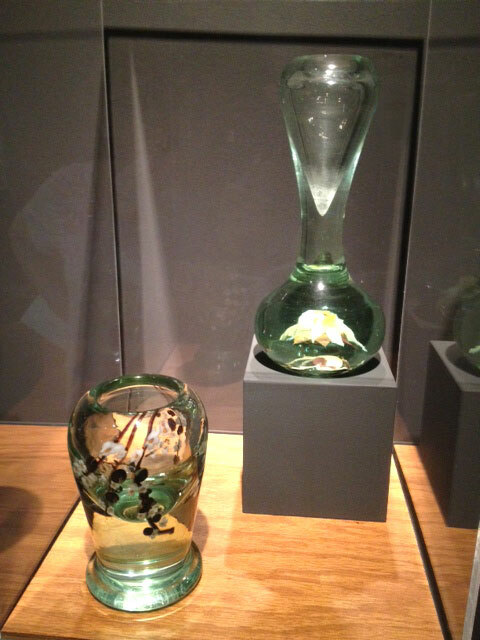 Third, the quality of the exhibits is very high. Fourth, buyers fly in from all over the world. Fifth, the show is in Miami Beach in the middle of winter (whoo hoo!). I wouldn’t be surprised if the total of all the merchandise for sale totaled $1 billion. I would also guess that many tens of millions of dollars of business will be transacted over the course of the show. I was lucky to buy some superb items during the set-up. 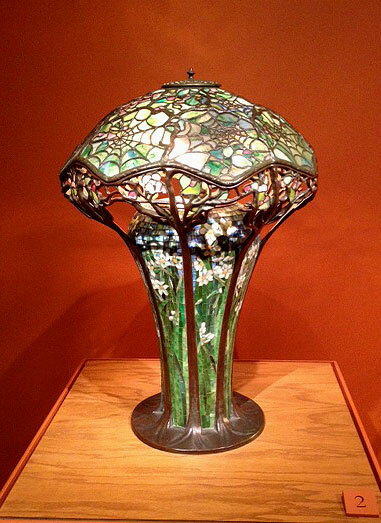 In no particular order, I bought a rare and important Le Verre Francais Palmiers Bleus vase; a superb Tiffany Favrile green-black millifiori vase; a Tiffany Studios green turtleback swivel desk lamp; an R. Lalique highly opalescent box, Houppes; a Handel boudoir Venice scenic lamp; and finally a large 19th plaque of a beautiful woman. The show runs from Thursday, February 2nd at noon, until Monday, February 6th at 6 PM. If you haven’t made your plans to come, there’s still time. The weather is great and so are the restaurants. You’ll thank me. There’s only one more show in Florida for us after this one and that’s the important Palm Beach Jewelry, Art & Antique Show. It runs from February 18 to February 21 and has some of the best dealers in the world exhibiting. We have a week in-between to rest and we’re really looking forward to it.